While I am in the process of building my living quarters inside Box Van, I will continue to live inside Scampy. That way, there will be no pressure. I will be able to enjoy each project to the fullest. When I was running rivers in a kayak or raft [The 70s and 80s], it was necessary to "read the rapid". Sometimes the rapid was big and long. So, when scouting out my course, I would break up the sections of the rapid in my mind. Figuring out each section by itself was less formidable than the entire rapid. That's how I think about Box Van. One project at a time. So far this morning I have traveled 27 miles in 3-hours! Will I ever arrive in San Diego? We have been traveling with our pedal to the metal! Flank Speed! 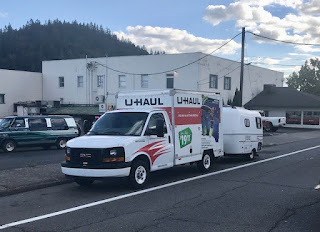 We are only 50 miles from Grants Pass Oregon. That will give us 205 miles today! George had to stop to nap a few times inside Scampy. But that's OK. That is what Scampy is for! This town holds a lot of memories for me. During the 80s and early 90s, I ran the Rogue River's Wild and Scenic section many times. Nearly always with my son, David. This afternoon I drove passed the I-5 turn-off that leads to Almeda Bar. That's where we always camped. I made a quick decision to not turn-off. Been there. Done that! I know here in Canada a box van or cube van is licensed and insured differently than a motorhome. Have you looked into licensing and if your insurance company will insure a cube or box van with living quarters? I know from past experience in conversions of straight trucks they were hard to insure and license as a motorhome. It is also hard to certify the propane system and the tank if you do it yourself. Many people will not certify stove, furnace etc in a conversion. You end up running your system using a 20lb BBQ bottle for propane which becomes a pain really quickly. too bad you couldn't find a class B motorhome with a garage that needed work and you could fix it as you go. Just a thought from the cheap seats. Hope your project goes well. Some insurance companies in the USA do not insure commercial vehicles owned by private individuals. Progressive Insurance, my company does. What is painful with a 20 lb propane tank? Hi George, nothing is painful about a 20lb propane tank, at least you know when its close to empty. As we know, the guages on R Vs are LESS then accurate when it comes to propane, water levels, house battery charge, etc etc. I too have thought about a 10'box truck for conversion. not sure about your intentions on outfitting it but may I explain mine ?I would keep it as simple as possible. no fixed water or holding tanks or plumbed propane system. 6 gallon water jugs and 20lb propane for Mr Heater. install RV windows on each side of box. a window unit air conditioner mounted above cab with generator mounted on rear bumper. a fantastic fan or 2 in roof, a few solar panels and house batteries. porta potty. shower is a 2 gallon bug sprayer with hand pump to pressurize. I assume you're getting a truck with access to box area from driver's area ? they are available. the only area I haven't planned out is the rear entrance from ground. some sort of step needs to be designed for easy access.Im currently living out of my Roadtrek class B, but I do have thoughts of going with a 10 footer as you are. best wishes on this project, Im looking forward to following along. It appears as though you have planned nearly everything about your conversion. I have not, and intend to kind of play-it-by-ear as I go along. That is how I RV. No daily destination. Just winging it! There are 3 types of floors in box vans, low, medium and high. They determine the height of the flor for entering. High and the inside floor is completely flat, medium and you have short tire bump-ups, and low you have tire bump-ups like in a pickup truck. The low profile, you loose a little on the inside but a lot lower step to enter. Just something to consider. Yes, Progressive does insure commercial vehicles owned by an individual or sole proprietor of a business. But the "kicker" is when Progressive asks the question, "What are you using or intend to use the commercial vehicle for?" What is kicking about your question? Insurance companies determine what they "WILL" cover but each state insurance commission determines what they "CAN" cover in its state. Just because the "WILL" doesn't mean the "CAN" and just because the "CAN" doesn't mean they "WILL". The kicking is "when Progressive asks you the above-stated question" and when you truthfully answer the question, they make a decision (hence, "the kicker") based on your use or intended use of the commercial vehicle. I already have been told by one of Progressive's agents about intended use. I am not going to have any problem with my intended use because Progressive covers it. Then, you are good to go! California's insurance companies and its commissioner are very liberal; wish my state was. Then, your state DMV will probably go along with your insurance company and classify it as a recreational vehicle because of its intended use. I have been looking at several more box van conversion videos... very interesting. I found several in the mode of "what I would do differently" to be most of valuable. #1 point in one (where he had 7 tips) was to put electricity in first: then you have that electricity to run all your tools and electronic gear. Next was the insulation. Many great ideas from many different people who did their own conversions. Composting toilets seemed to be the norm. One young guy had a shower: a curtain surrounding a ceiling fan when he wanted to shower (not permanent) with water supplied from a hand pumped container. He stood in a large plastic tub! Genius! Lots of ideas for draining sinks. Several created a "garage" in the back for their propane tank. Allowed use as a "back porch." One used a lift gate as his "patio." Looks like you will have many projects for many months. Roll up back door seemed preferred to close off back porch area with vents for propane. Have fun. Lots of ideas for me! I don't need somebody else doing what I am planning to do in order to feel comfortable. I guess that I have learned to be confident that what I do will turn out right because it most times it does! PS: That guy in your URL. Kinda ugly creation! Ahi tuna and avocado...great choice! 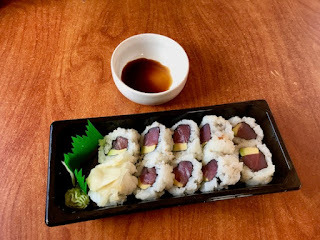 No wasabi in the soy sauce? Makes it so tasty! 27 miles in 3 hours? I smear wasabi on to the sushi with my finger! Gross? Maybe so. But that's what I have been doing for sooooo long! Mister Ed, no no. I don't doubt you. I appreciate the information. Thank you. 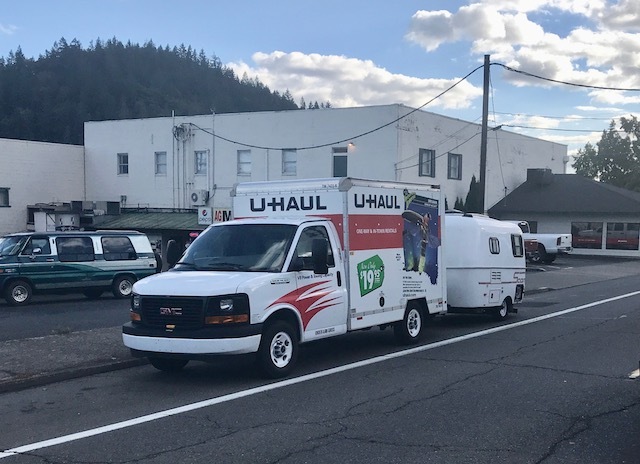 George, I was looking at the pic of the U-Haul towing Scampy and remembering the pic of the load of.... ahhh, important possessions that you travel with and I wondered why not get a box truck and keep towing Scampy. You'd have a great shop in the box truck, multiple solar panels on the box truck, with a adequate battery bank of AGM or Lithium batteries in the box truck and I don't think it would cost you any more than doing the RV conversion of the box truck. Yes! You are correct! If I choose the option that you describe, I will have both the living quarters of Scampy and the workshop of the U-Haul box van. That would be a 2-vehicle rig. On the other hand, if I choose the option of my living quarters and the workshop inside a box van, that would be a 1-vehicle rig.